Two weeks ago, before the madness of the ice storm, I promised you my favorite recipe for using homemade seafood stock. Today, I deliver! While my sister is definitely the risotto champion in the family, I love to make it on days like today when the weather is cold and dreary. The rich, creamy texture of this one pot meal brings comfort, while the tender asparagus and bright lemon zest carry promises of spring. Some people think of risotto as impossibly difficult, and I used to be one of those people! This is because it’s not a dish you can just walk away from. It requires constant stirring. But that doesn’t mean your slaving away in the kitchen. Here’s my risotto secret. You ready? That’s right, I make sitting risotto! I got this stool from my grandparents when they moved into the nursing home. They hadn’t had the energy to stand for the few minutes it took to microwave their food, so my father got them this stool to keep in the kitchen. I decided that was a brilliant idea and have made it my risotto stool. Instead of feeling stressed and hovering over a hot pot, I relax on the stool, out of the path of steam, watching videos on my laptop. It’s actually a great way to wind down after a long day! 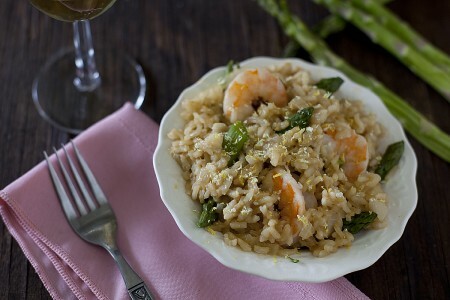 -Use arborio rice, sometimes called risotto rice. It soaks up the liquid so beautifully! -Don’t skip cooking the rice in oil or fat at the beginning. This can help keep your risotto from getting soggy. -No matter what other recipes tell you, you do need to stir throughout the cooking time. Trust me, I’ve tried ever shortcut and failed miserably! -Taste, taste, TASTE! The best way to know when your risotto is done is to keep tasting it. When the grains of rice no long crunch you’re good to go. If you cook them too much longer it will turn to mush. Have any risotto questions? If I don’t know the answer I’ll consult my sister. Seriously, her risotto is always amazing! The rich, creamy texture of this one pot meal brings comfort, while the tender asparagus and bright lemon zest carry promises of spring. Snap the woody ends of your asparagus and slice them into 1 1/2 - 2 inch sections. Blanche them in boiling water for 4 minutes then transfer to a bowl of ice water. Heat stock (and water if using) in a pot on high. Once it begins to steam turn the heat down to medium low. Melt butter (or coconut oil) in a pot on medium high. Add the chopped onion and cook about 3 minutes until just softened. Add the rice and stir to get everything coated in the melted butter. Add one cup of your hot liquid and stir. Continue stirring until most of the liquid is absorbed, then add another cup of hot liquid. Repeat this (sitting on a stool for comfort!) until your fifth cup of liquid when you should start taste testing the rice grains for your desired texture. You may not need all six cups, or you may need a little bit more (in which case you can use some boiling water). When you add your last cup of water, toss in the raw shrimp. Once they spend about 2 minutes in the pan, flip them over. They should turn pink pretty quickly. 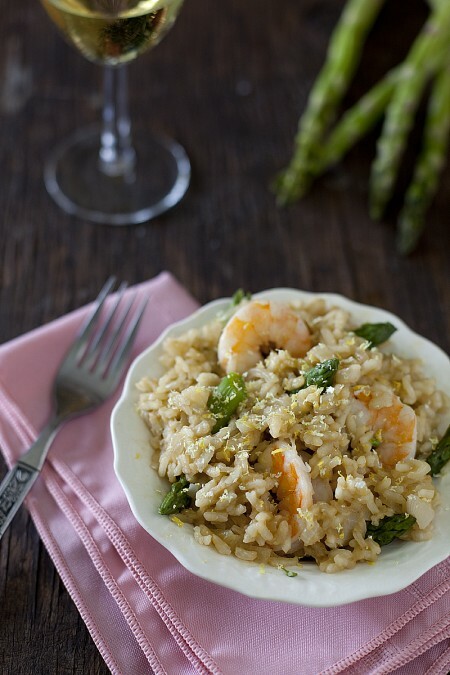 When the shrimp are pink and opaque and the rice is to your desired texture, drain the asparagus and mix it in, then sprinkle the grated cheese, salt and pepper over everything. Give a final, gentle stir before serving. Approximate cost/serving: By cutting the asparagus into about 3 pieces each and doling out 3 shrimp a person, this recipe is a lot more affordable than it seems. My stock cost me about 50 cents a cup. This recipe cost me about $7.50 to make, or $1.88 a serving. Pretty nice for a decadent seafood meal! Gluten Free: This is a naturally gluten-free recipe. Just be careful where you get your arborio rice. My friends who have gotten it at bulk bins have suffered from cross contamination. Risotto aka Italian rice to our exchange students. I’ve not made risotto or seafood stock, but it seems like I should. Sounds so good right now. 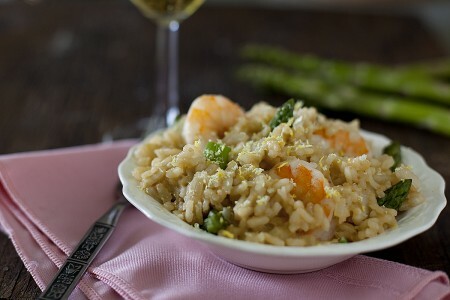 My risotto recipe says to only stir a few times during cooking and it always turns out great! From America’s test kitchen. I’ll have to compare the recipes and see what the difference is, now I’m curious!